Tom Simoneau presents Oded Shakked of Longboard Vineyards, today on California Wine Country with Steve Jaxon and Dan Berger. They begin by tasting the sparkling wine, which is made with no dosage, so it is absolutely dry. 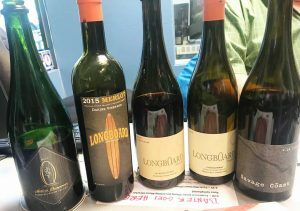 It was Tom Simoneau’s Sparkling Wine of the Year for 2017. They can use the term Methode Champenois, without calling the wine “Champagne” which is a protected term of origin. Steve is not a huge sparkling wine fan but he really likes this. That fact that it has no dosage lets people taste the quality of the yeast, as Oded explains. Steve asks Oded Shakked to talk about his background. He has surfed on four continents. He grew up about 100 yards from the beach, in Israel. As kids, they used to float on anything they could, to catch waves. In 1959, a California surfer, Don Paskowitz, brought surfboards to the Tel Aviv beaches. He got his first US surfboard soon thereafter and surfing took off there too. After his military service, he thought he would go into architecture. He was building surfboards for a living and living on the beach. He liked to travel to the Atlantic coast of Europe to catch bigger waves. He was introduced to good wine in those countries. Then he decided to attend the UC Davis wine program, coming to Sonoma County in 1984. Oded Shakked started Longboard Vineyards in 1998. He was lucky to find good jobs in the wine business after graduating. He had Champagne experience from working at Moët Chandon and he had Bordeaux experience from Chateau Lafite. He was their first American intern. Then he was hired by the Jordan family in California, as an intern, and stayed on the sparkling wine project, which became the J wine company where he was winemaker for 18 years. One day he decided he would excnahge a raise for production space, so he started Longboard so he could visit his distributor in Hawaii and go surfing too. Now he has been his own boss since 2005. He is in a building that used to be the Clos du Bois winery, and was previously a cannery. One of his wines has the cannery on the label and the proceeds go to the Healdsburg Museum. Tom remembers Friday afternoons at the Clos du Bois tasting room. 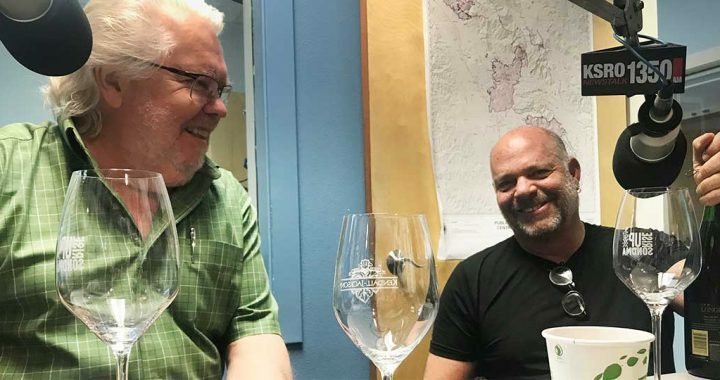 Dan and Tom remember some of their favorite old Clos du Bois wines, that they still have in their cellars. Tom points out that Longboard highlights cool region reds, like a Cabernet from Rochioli and a sparkling wine. They made the first one in 2012. They have Pinot Noir, Syrah. He has 5 Syrahs. Oded says these are wines that foodies enjoy, and he is a foodie. Steve loves this 2015 Chardonnay, from grapes grown by the Rochioli family. Oded says they are so serious about the grapes and that his family is friends with them. His personal favorite clone of Chardonnay is one that grows in the cooler region. He picks the grapes about 3 or 4 am and they are pressed by 6am. He just lets it sit, he does nothing to it, as he explains. They discuss all the flavors, including some banana. Oded explains how he leaves it on the lees and does battonage, mixing it. Dan says it has richness in the smell, but the acid balances it all out. The nose doesn’t suggest that crispness that comes out after tasting. He only makes about 140 cases per year and it’s mainly sold at the winery or shipped by order. Oded Shakked talks about being a surfer and surfing in Hawaii. He travels and speaks several languages. In Hawaii they have “talk story” as a storytelling tradition. He also mentions that it’s way too cold to surf in northern California. Oded says they walk a fine line because they are very serious about their wine and he pays a lot of money for the grapes he uses. But he wants people to enjoy the wine. “It’s just wine,” says Oded. Oded Shakked talks about buying the vineyard adjacent to his home and found it is planted in Merlot. He started producing it right when Sideways came out. They taste it, it’s the 2015 Da Kine Redwood Merlot, Dan thinks it is too young and will be best in three years. Tom thinks even if decanted now, it would be better, but also just about 3 or 4 more years would work. Oded likes to age wines, but there is no market. Most people prefer to buy the fresh wines. Tom says that’s what people are used to now. Next they taste the 2016 Mystos Pinot Noir. Dan says the fruit component is dramatic but it is so young that’s all he gets. The secret to this wine is the acid. He only makes about 90 cases of this one. Oded Shakked also has a collection of old restored surfboards, on display at the tasting room, and he also has an old Ford station wagon. Then they taste a Syrah blend, which as Oded Shakked explains, like many good things in life, was born from a mistake. In 2013, two of his best vineyards came in at the same time and instead of sending the two varieties to separate tanks, they sent all the juice to the same tank. He was very angry about that when it happened by mistake, at first, and that’s unusual for him, as he’s such a laid-back guy. But it worked out well in the end!